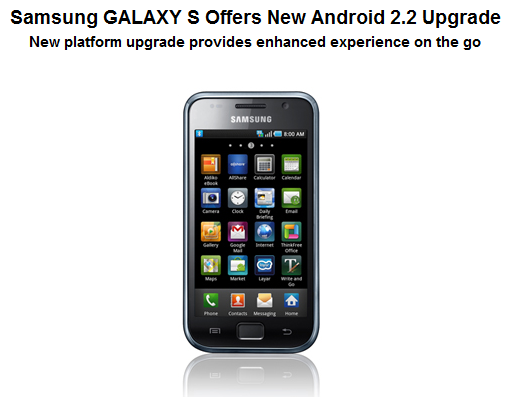 Android 2.2 Starts Rolling Out for Galaxy S Phones, No More Bing? Samsung announced today that their Galaxy S lineup of phones is starting to see Android 2.2 in the “Nordic” region of the world, but should filter out to the states by the end of the year. OK, it doesn’t even say “end of the year” it says “gradually.” Quite the timeline right? At least it’s happening! One interesting thing to note is the point made in their press release about Froyo featuring “Google Maps with Navigation.” The release specifically mentions our favorite navigation app as one of the key features, but as you all know, the Fascinate (review) comes packed full of Bing. Any chance this sneaks onto the Verizon version without that other search engine suite? Unlikely. The Android 2.2 upgrade will be available via Kies, Samsung’s unique in-house software upgrade program. Kies can be downloaded at the Samsung mobile website (http://www.samsungmobile.com). The GALAXY S is Samsung’s cleverly designed smartphone with a bright 4-inch SUPER AMOLED screen and a 1 GHz application processor, giving users an intelligent, immersive and integrated mobile experience. The Android 2.2 upgrade offers voice-controlled GPS through Google MapsTM with Navigation, faster performance by JIT(Just in Time) compiler. Additionally, further functionalities including Search in-browser, Adobe® Flash® Player 10.1, improved customization options will be provided with OS upgrade. Angry Birds Now Live in Android Market!